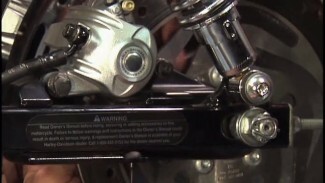 The Softail shock is one of the most neglected components on a Harley Davidson. Although not easy to access, the shock assembly does require regular maintenance. The design of this shock assembly allows for it to accumulate road debris. The front side of the shock assembly has a number of (aprox 3/8″ size) holes. Over time, your Softail shock may develop an annoying squeak from this build up of road debris. In this video Bob not only shows us how to service the shock assembly, but he also upgrades the shock with a heavier spring compliments of LA Choppers. Set up the shock on a hydraulic press. Make sure the shock is set up straight and square as it is under a lot of pressure. Press down until you are able to pick out the retaining ring, then slowly release pressure and allow the shock to completely extend. With the Softail shock on the bench, take note of the order and orientation as you slide the assembly apart. There are only a half dozen parts that you will be dealing with during this service. You have the canister – the spring – nylon sleeve – a seal – nylon “top hat”, or spacer – the hydraulic shock and a retaining clip. Thouroughly clean all of of these parts before reassembly. To complete this service; correctly reassemble the Softail shock assembly and set it up in the hydraulic press. Press down until the retaining ring can be reinstalled securely into the canister body. Verify that the ring is seated before releasing pressure. 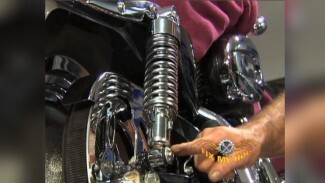 Take the time to service your Softail shocks. 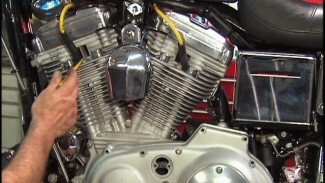 Don’t neglect this very important component of your Harley Davidson.